Although laptops are now ubiquitous in classrooms, research from Princeton and UCLA shows that handwritten notes are still better. This is because a student can't possibly write down every word verbatim, and this causes them to process the material in a different way than if they were typing. This extra step actually helps students grasp overarching concepts better. Click over to this NPR article about the research if you'd like to learn more specifics about why this is the case. 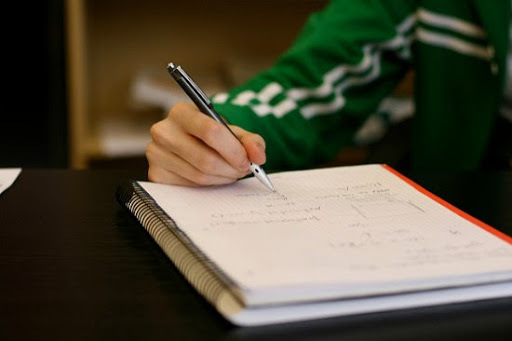 Knowing that writing notes by hand is better, how can students with ADHD and dyslexia get the benefits of handwritten notes when this activity can be such a challenge? I would recommend that the student learn a note-taking strategy such as SQ3R or Cornell and pair that with recording the lectures. Your student's IEP or 504 plan might also include an accommodation to receive teacher outlines and/or other students' notes as well. Another option is to invest in a Livescribe Echo Smartpen, which records while you write. The next step is for the student to review their notes no more than 24 hours after a lecture. This can become part of one's nightly homework, to review the notes from the day and to notice anything that needs clarification. This last step is crucial: it is important for students to recognize what they still don't understand and get help from their teacher or a tutor in the following days. These skills are not often taught in school and they do take practice to learn. If you think your child could benefit from note-taking practice, please let me know.